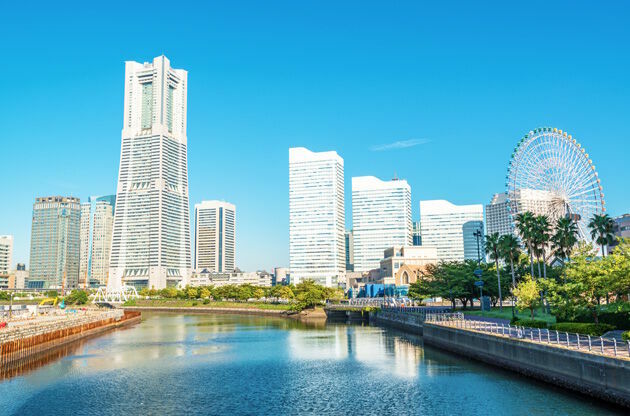 You will find the best tips about restaurants, attractions, accommodation and the shopping spots in Yokohama, Japan on this page. Yokohama city, also known as Hamakko in the local language, was introduced to the world as the first harbor city of Japan. Since then, it has been accumulating as much information and cultures as possible for introducing everything which Japan makes first in the world. Whether it’s a new food item or a new robot, Yokohama defies all that is modern in Japan. The city can also be easily described as cheerful and sophisticated. Yokohama was thrown open to foreign trade in the year 1854. In the same year, the rail line connecting Yokohama with Tokyo was introduced. However, much later in the year 1923, the city was largely affected by the Great Kanto Earthquake. Then again it was attacked by fire-bombs during World War 2. Having lost its prominence to the multiple attacks, both natural and human made, Yokohama has remained a port city with an amalgamation of cultures since then. Today, the city is the place for all sorts of innovations in technology and science. The various scientific research centers and universities, like the Yokohama City University, here have contributed a lot to the advancement of modern science. Along with being a science and techno hub, Yokohama is also the city of dreams for every Japanese citizen. The ideas generated by the brilliant minds in the city are always fresh just like the gentle breeze which flows through the city. The weather is pleasant during the autumn and spring seasons and is humid in summer. During winters, the cold is mild and the snowfall is low. It is located at the island of Honshu which lies towards the south of Tokyo. In order to reach Yokohama, you have to go to Tokyo first because there is no airport in the city. There are trains and buses available from the Narita Airport to Yokohama. A ride on an express train from Tokyo to Yokohama takes about 1 and a half hour. The buses travelling from Tokyo to Yokohama are luxurious and are known as Limousine buses. A bus ride takes about 2 to 3 hours. This is the place to be if you enjoy fine dining and shopping together. Apart from housing the historical Yokohama Red Brick Warehouse (complex housing shopping malls, event venues and banquet halls), you can also enjoy other amusement and entertainment facilities. The best thing is that all the attractions are close to each other and you can just walk out from one only to walk into another. Are you a big fan of football? Want to explore something which is not a garden or a park or a shopping mall? Then you need to be at the Nissan Stadium, also known as the International Stadium of Yokohama. This is where the real fun comes in. Taking a break from all the hopping and walking around, you can enjoy all the unique food the city has to offer. The most popular attractions are the gourmet cafes and the sweets restaurants. Yes, that is right. These restaurants serve sweet delicacies like sweet chestnuts, gelatos, steamed jam-buns, fruit tarts and sweet Chinese drinks. Most of these restaurants are located in the “ChinaTown” of Yokohama. Not in a mood for Chinese food? There are some restaurants serving Western and Japanese sweets as well. These can be found in the locality of Isezaki-Cho and at the Motomachi Shopping Street. Wherever you go in the city, you will always find a sweet shop. They are everywhere from alleys to parks. Are you in the mood to splurge? Want to enjoy the best food that is available in the world? Then the “Landmark Tower” is the destination for you. Along with eating the best food, you will get to enjoy breathtaking views of not just Yokohama, but also of Tokyo. The best thing about the nightlife of Yokohama is that it is just as busy as the city is. The clubs and the bars light up the skyline of the city as soon as the sun sets in. These nightclubs focus eminently on welcoming and providing a great time to their visitors. However, many nightclubs in Yokohama are small with compact dancing floors. Space is in short supply, but entertainment is not. The locality surrounding the Yokohama station, especially the West exit is dotted with various department stores, fashion boutiques and food stores. It is the place for having a good time along with some shopping. There is a Chinatown in almost every big city of the world and Yokohama is no different. The Chinatown is the biggest in the whole of Japan and goes as far back as 1859. It is the perfect place for a tourist as the locals spend most of their time in showcasing the best of Chinese culture. Whether its knick-knacks you are looking for or groceries, Chinatown offers the perfect Yokohama shopping trip. Once you embark from the coach, you can explore Shinjuku attractions like Minami Guchi(South Gate), Higashi Guchi(East Gate) and Nisi Guchi(West Gate). Shinjuku is also filled with high-end electronics stores, department stores and luxury stores. You can also visit the Shinjuku Gyoen(English and French Gardens) and the Meiji Shrine(Shrine dedicated to Japanese Emperor Meiji) by taking the subway or a train. Yokohama offers unique venues to anybody looking forward to arrange an international meeting/seminar/conference here. From offering the best hotel rooms to state-of-the-art convention complex, the city gives a business everything it needs. Alternative options for meetings include serene gardens, cruise ships or the Red Brick Warehouse. Whether it is promotion that you need or assistance in planning a convention, Yokohama offers everything.